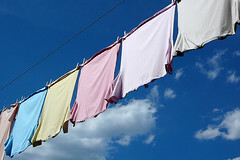 Find out how to line dry your clothes without getting into trouble — and what not to do with recalled peanut butter. February 9, 2009, 1:25 p.m.
>> Can I compost recalled peanut butter? Only if “your compost reaches and maintains a temperature of 135 degrees for several days,” according to Umbra, advice columnist at Grist. Chances that salmonella from the compost will make it back into your mouth is remote, but not a risk worth taking.